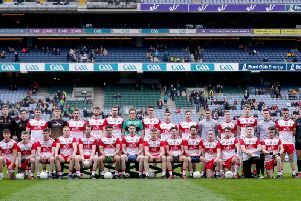 The launch of the new Derry GAA Jersey proved a huge success with the #MoreThanAJersey tag used to promote the 2016 Oak Leaf shirt among the top topics in Ireland on Wednesday night. Representatives of county sponsors H&A Mechanical Services and O’Neills Sportswear were joined by Derry officials, senior football manager, Damian Barton, hurling manager Tom McLean and senior players in both codes to officially launch the new look for 2016. Featuring a range of graphics and photographs, from the initial unveiling of the new kit, to former Oakleaf greats Jim McKeever and Roddy Gribbin, the campaign took a behind the scenes look at the production of the jersey at O’Neill’s headquarters in Strabane where the new top was manufactured this week. The new Derry Jersey was launched at the O’Neills Superstore in Magherafelt where County Chairman Brian Smith wished everyone who wears the new round neck jersey the best of luck for the season ahead. “I would like to thank Hugh and Anne McWilliams and all at H&A for their dedicated and generous support of Derry GAA,” said Mr. Smith, “I want to wish them well with all their business endeavours for the year ahead. “We are proud to be associated with O’Neill’s Sportswear - a local company and a major employer here in the North West - and I would urge everyone to support both O’Neills and H&A with their business and recognition. On a personal note, I want to thank managing director Kieran Kennedy and his staff for their professional assistance in the design and production of our new jersey. Kieran Kennedy, Managing Director at O’Neills Sportswear echoed those comments and said the Oak Leaf jersey had always proved one of the most popular. “On behalf of O’Neills Irish International Sports Co. Ltd, I would like to offer our sincere thanks to the Derry County chair Brian Smith and the Derry county committee for their continued partnership with O’Neills. “Derry is one of our most popular jerseys, constantly in demand not only at home but worldwide. “We also welcome H&A to this sponsorship partnership. Like ourselves H&A are a local company providing reliable secure employment to local people. In the current economic climate, where jobs are under threat, securing local jobs by supporting local business is at the core of the GAA. community.